Printed using a proprietary type (an Antiqua) designed for Bremer Press by the director of the press, Dr. Willy Wiegand. The font was cut in Frankfurt by Louis Hoell (a typecutter who cut many types for designers in the heyday of German printing in the early twentieth century). The two sat side by side for days, cutting, filing, and proofing the font. 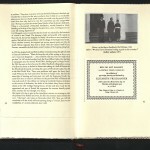 Edition of two hundred and seventy copies. University of Utah copy is no. 8. And a cockerel’s feather in my hat. 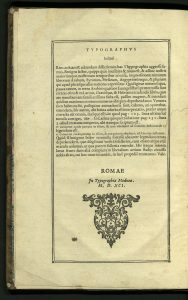 Strabo’s Geographia was the first attempt to collect all the geographical knowledge available at the time and to compose a general treatise on geography. Strabo designed his work for the statesman, rather than for the student, giving a general sketch of the character, physical peculiarities and natural productions of each country. The descriptions were invaluable for their wealth of information regarding ethnology, trade, and metallurgy. The impact of early printers on their world was extraordinary. 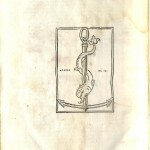 The works Aldus Manutius chose to print reflected the great diversity of the interests of his day. 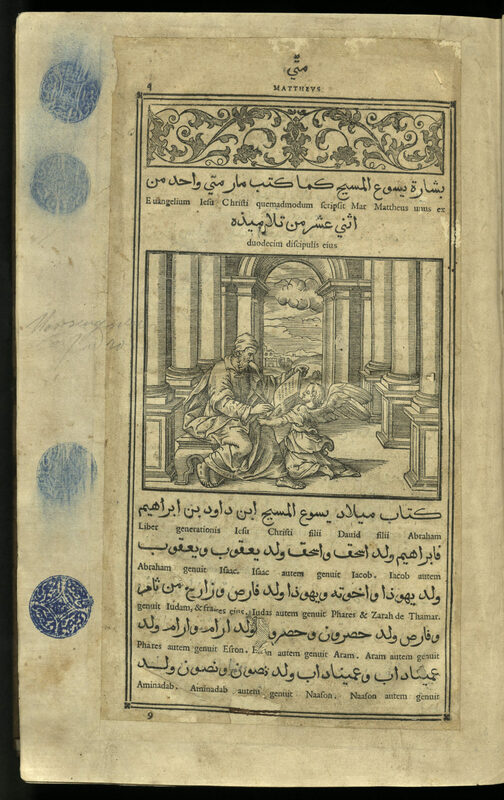 He printed Greek and Latin classical texts, grammars, religious writings, secular writings, political and scientific writings, histories, and geographies. 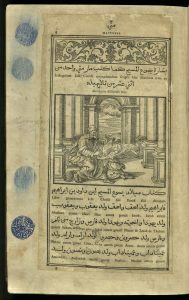 Aldus influenced his world with his craft as well as his scholarly pursuits. His work was recognized for its attractive and readable typography, clean lines and fine design. He designed and cut the first complete font of the Greek alphabet. 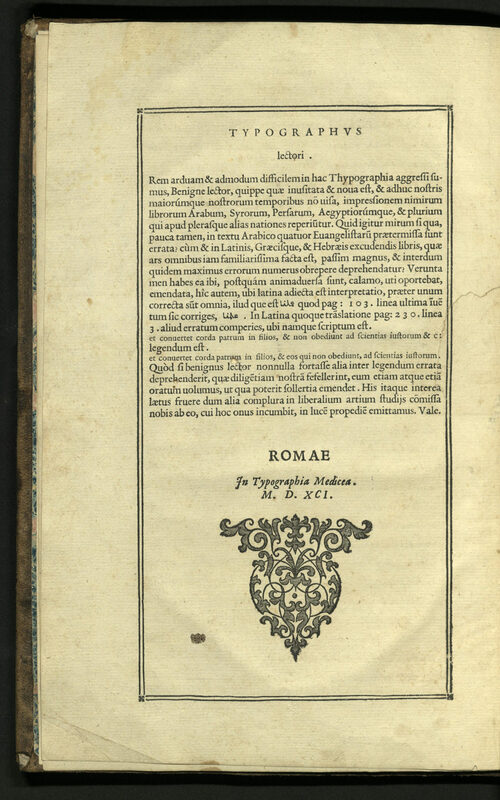 He helped design a type after Italian cursive script said to be based upon the handwriting of Petrarch. This was the first italic font used in books. Well aware of the power of the press, he was particularly concerned with producing books of small format and low cost for the benefit of students. 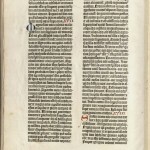 A leaf from the Old Testament, Samuel, 2nd, xxii-xxiii, from a Latin translation dating to about 380. 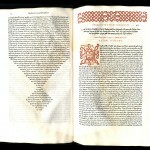 The first book printed from moveable metal type, the Biblia Latina or 42-line Bible (in reference to the number of lines in a column) was based on medieval manuscript design. 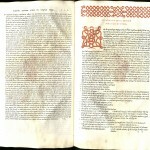 The typeface was developed after a book-hand used in western Germany during the fifteenth century for liturgical works. Known as “textura,” this formal upright and angular hand features letters that have pointed feet and almost no curvature. The first font of type, made by goldsmith Johann Gutenberg, consisted of nearly three hundred characters, including variant forms of letters, ligatures, and abbreviations to simulate as much as possible manuscript conventions. 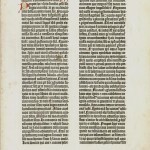 Gutenberg’s choice of the Bible as his first printed publication was a good business decision. All copies (approximately one hundred and eighty) had sold before they were off the press. 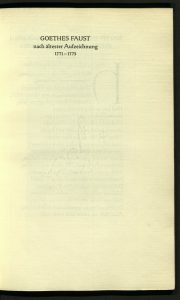 Forty-eight full copies are known to exist today, thirty-six on paper and twelve on vellum. A. Edward Newton’s bibliographical essay for this leaf book was printed under the direction of Bruce Rogers at the shop of William Edwin Rudge. 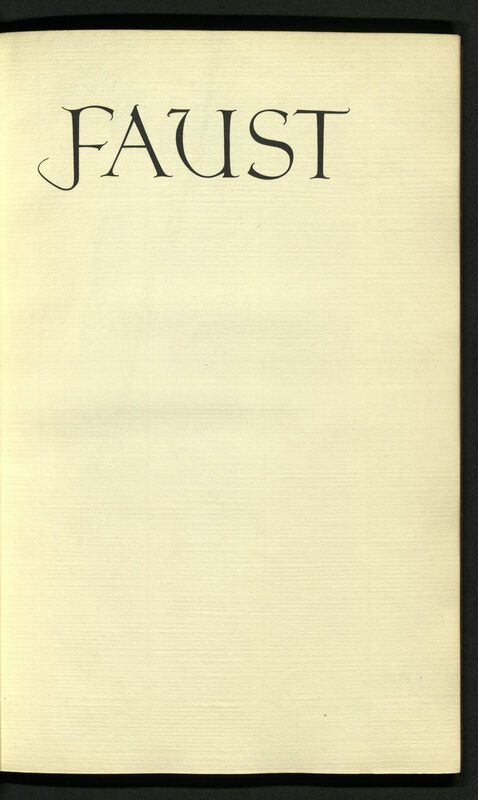 Bruce Rogers (1870-1957), the distinguished American printer and typographer, is widely recognized as one of the most talented book designers of all time. He spent his earliest years as a designer with Riverside Press, then as a freelance artist during which time he worked with the printing house of W.E. Rudge of Mt. 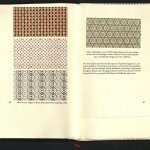 Vernon, New York, the Grolier Club, and the Limited Editions Club of New York. 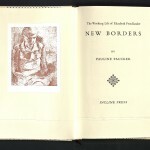 Rogers established American fine press standards, insisting that the design of a book – its type, illustrations, and format should reflect and enhance the author’s text. He designed more than seven hundred books. Rogers also designed Centaur type for the Metropolitan Museum of Art in 1914. 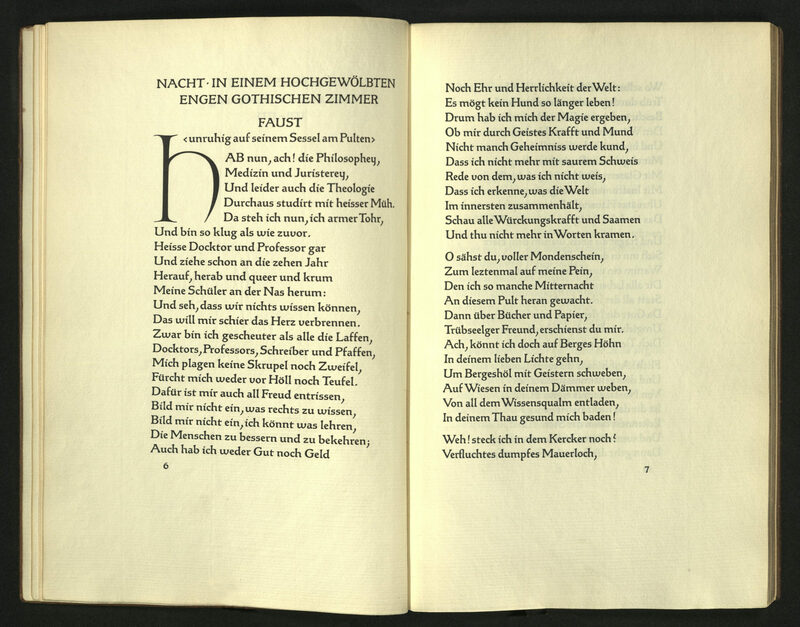 Released by Monotype in 1929, Centaur is modeled on letters cut by the fifteenth-century French printer Nicolas Jenson. Centaur has a beauty of line and a proportion that has been widely acclaimed since its release. An attractive typeface for books in particular, it is effective for shorter texts. Bound in black morocco, lettered in gold on front cover.